Updated 3/25/2018 at 10:23 a.m.
Now that the Craven Terrace low-income housing project has been outsourced, downsized, and renovated, the New Bern Housing Authority is turning its sights on what to do about Trent Court. The “competitive location” would be used to build new low-income housing to add to, and in some cases replace, housing stocks in Trent Court. As of now, that competitive location is a 30.8-acre, city-owned property off Carolina Avenue between the Pembroke Community, Trent Road and U.S. 70 (maps, left and below left). The parcel is more than twice the 14 acres the Housing Authority owns that includes Trent Court, New Bern Tower, and numerous other residential structures, although, according to Housing Authority Commissioner Bill Frederick, only 9.7 acres are not subject to flooding and would be usable for housing. Google Maps close-up shows the location of the Carolina Avenue property. 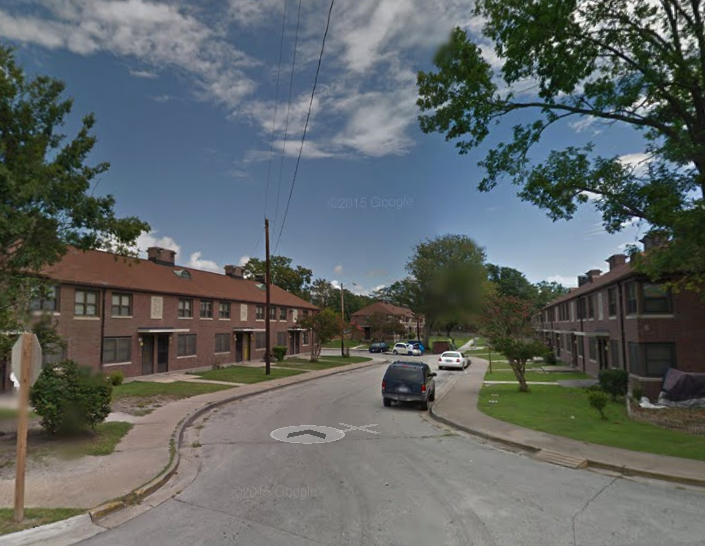 Little has been discussed publicly about the Housing Authority’s plans for Trent Court over the past seven years, while at the same time it was privatizing and renovating Craven Terrace, a larger housing project located north of Broad Street. Craven Terrace was quickly identified as an area worth preserving for public housing, mainly because of its lack of market potential. Surrounded by small parcels with low property values, Craven Terrace is much larger than Trent Court and presented a bigger problem in terms of relocating residents there. In the end, the Housing Authority secured historic status for the buildings in Craven Terrace, which in turn allowed for tax credits that helped pay for renovations, razing several buildings subject to flooding, and adding amenities including a playground and laundry facility. The Housing Authority also outsourced management of Craven Terrace. Trent Court is less than half the size of Craven Terrace in acreage and number of residents. But more importantly, its proximity to Tryon Palace, the Historic Downtown District, and a navigable waterway make it much more commercially attractive for would-be developers. Enter Carolina Avenue. The largest single undeveloped parcel owned by the city at more than 30 acres, it is not included on the city’s surplus properties for sale website. Wooded without any buildings, it is unique in New Bern in that it is both a waterfront property (there’s a small lake formed when N.C. DOT quarried dirt and gravel to build the U.S. 70 bypass) and has access to Trent Road. Still, due to the wetlands, only a third is developable. Housing Authority officials have been quietly approaching city officials, the Board of Aldermen, and the Pembroke Community about acquiring the Carolina Avenue property for subsidized and low-income housing. “The NBHA bid was $200,000,” Commissioner Frederick told the Post. When Blaney refers to more recent frustrating discussions, he’s referring to Ward 2 Alderman Jameesha Harris, who has reservations about the plan and who called it “gentrification” in a Facebook post on Thursday. Her ward includes the Pembroke community as well as the Carolina Avenue property the Housing Authority is interested in. The plan has a lot of moving parts but boils down to this: The Housing Authority wants the Carolina Avenue property so it can secure funding to build affordable housing there. It would then move residents of Trent Court and others living on Housing Authority land in that area to the new housing off Carolina Avenue. That would enable the Housing Authority to raze many if not all of Trent Court’s buildings and replace them with a mixed-income residential development that it would still manage, either directly or indirectly. It would involve moving low-income residents from Trent Court, ostensibly on a temporary basis, and moving them to housing to be constructed on Carolina Avenue adjacent to the Pembroke community. Once a new and improved Trent Court emerges, former residents would be given the opportunity to move back if housing is available. “The proposal made to Ms. Harris was that the city donate the property to NBHA, freeing up our proposed $200,000 bid to rehabilitate the Taylor Building in Trent Court as a permanent home for the Boys & Girls Club,” Commissioner Frederick told the Post. As it appears now, what would be built where Trent Court exists now would be a mix of high-, middle- and low-end housing and subsidized housing. The Housing Authority plans to leave a waterfront green space between Walt Bellamy Drive and Lawson Creek, and according to a source, that waterfront property is what the Housing Authority is willing to trade to the city for the Carolina Avenue acreage. One problem with Trent Court is that the next time it floods in that area, affected buildings will have to be vacated and razed. No more money will be spent to bring them back to habitability. That puts a gun to the Housing Authority’s head to find substitute housing quickly. He said in his memo that he has spoken with three Pembroke residents about the proposal. “Two of the three indicated that my explanation was not exactly as an earlier one given by their alderman. They still expressed misgivings, however. Blaney has scheduled an interview with the Post on Tuesday morning to provide further information about this issue. Facing opposition from Alderman Harris, proponents of the plan have attempted to sweeten the pot in an effort to gain her support, including promises for a new Boys & Girls Club location and public works improvements in her ward, she told the Post. Harris, who represents the Pembroke Community as part of her ward, released Blaney’s memo on her alderman Facebook page on Thursday evening and explained her involvement in the plan. “I was invited to a meeting to talk about the city possibly donating a very big plot of land that is located in my ward in Pembroke,” Harris said on her alderman Facebook page. “They also wanted us to pay the cost of demolition of some Trent Court Buildings and they would in return give the city some waterfront wetlands. Harris said she didn’t agree with the plan and said it sounded like a case of gentrification (although she also said she would support the deal if the Housing Authority paid full price for the Carolina Avenue property). “Then I was asked to a second meeting but this time they added the Boys & Girls Club into to the mix,” Harris said. “Basically what I got out of the meeting is, we would help the Boys & Girls Club if the city once again provides the big plot of land in Pembroke. At this meeting, I personally made it clear that I am not in favor of any deal. “I have never given misleading information,” she wrote, referring to Blaney’s memo describing his version of the plan as different from hers. “I never stated that the city wants control over the property and I simply stated that I would only vote yes if full price was offered for the land. Commissioner Frederick said he was not aware of any request for the city to pay for any demolition in Trent Court, or any promises to pay for public works projects in her ward. I have been involved with the New Bern Housing Authority (NBHA) for 6 year and have recently attended the Meetings Ms Harris references. With all due respect, I certainly did not hear what she did. 1. The Carolina property is located in Ward 2. E.T. Mitchell was the appointed Alderman for Ward 3. 2. The Carolina property is slightly more than 30 acres, however only 9.7 acres are not in the flood plan and thus are usable. 3. The Carolina property’s tax value is $149,150 ( per your chart), therefore the minimum bid price is 25% or $35,038. The NBHA bid was $200,000. 4.The proposal made to Ms Harris was that the City donate the property to NBHA, freeing up our proposed $200,000 bid to rehabilitate the Taylor Bldg in Trent Court as a permanent home for the Boys & Girls Club. 5 I not aware of any request for Ms Harris to pay for any demolition in Trent Court. 6. I an not aware of any promises of any Public Works project for Ms. Harris’s Ward. Finally, I might point out that the “wealthy” Mrs Mitchell and her Husband donated $1,000,000 to the new Cancer Ward at our hospital. It would be nice if they demolished all of Trent Court and turn it into a city park under a different name. But, whatever the city plans to do, I just hope it is a wise decision for everybody.